America is in a developing crisis. The quality of life for most people is going from bad to worse. And the present system offers no hope for the better. There is no end to wars—one after another since the end of World War If. After Korea came Vietnam; now the Middle East is like a powder keg. Huge stockpiles of atomic weapons are a constant reminder of the threat of nuclear war. Pollution is destroying our environment—from the water we drink to the air we breathe. The economic crisis is worsening. Breakdowns, shortages, layoffs, soaring prices—each week it’s harder to get by. Suffering the most are those at the bottom of the ladder—Blacks, Chicanos, Puerto Ricans, and other doubly oppressed people. Neither the Republican administration nor the Democratic Congress offers a solution. They are only interested in shifting the responsibility and escaping the blame. They pit white workers against Blacks in a struggle for jobs, housing, and education. They blame all working people, claiming we eat too much and live too well. They say that inflation will slow down if we live in colder rooms and stop demanding higher wages. They blame people in other countries. They point to a “population explosion” in poor countries as a burden on the American economy, while the corporations they represent plunder the resources of these same countries. They say Arabs cause the energy crisis, as if the skyrocketing profits of U.S. oil monopolies weren’t responsible. The Democratic and Republican proposals are clear: Don’t struggle to defend your living standards; pay the costs of foreign wars; eat less and pay more; deport foreign-born workers; use less electricity and gasoline, forget about safety, Social Security, and jobs. The Rockefellers, DuPonts, Mellons, Morgans, and other families like them who run the country think they were born with rights that come first no matter what happens to the welfare and security of the rest of us. For the sake of profits they think ifs perfectly justifiable to lay off tens of thousands of workers, to destroy our environment, or to plunge the country into war. They are a tiny minority who brush aside the rights of the American people. protection from unreasonable searches and seizures, excessive bails and fines, and cruel and unusual punishment. A second revolution—the Civil War—resulted in additional amendments to the Constitution protecting the rights of the American people. the right of all male citizens, 21 years of age or over, to vote, regardless of race, color, or previous condition of servitude. More than 50 years ago women won the right to vote, and recently this right was extended to all citizens over the age of 18. These rights were won through struggle, and bitter battles have been required to preserve them against witch-hunters, racists, bigots, antilabor forces, and government agencies. Yet they have never been fully implemented nor do they extend to everyone. In reality, they are still denied to millions of Americans who are reduced to second-class status. Blacks, Chicanos, Puerto Ricans, and other oppressed minorities are struggling for equal opportunity in housing, education, and jobs. Preferential hiring and upgrading should be established to help achieve equality on the job. To gain equality, oppressed minorities have a right to live in the neighborhoods of their choice. They have the right to decide where to send their children to school, and to use busing to transport them to better, predominantly white schools. For minorities who don’t speak English, education, civil service exams, and voting instructions and ballots in their own language are needed to help achieve equality. Women are fighting to adopt and implement the Equal Rights Amendment to the Constitution to help achieve equality in all spheres 2f life. Preferential hiring and upgrading, and equal pay for the same work are needed for women to gain full equality on the job. Democratic rights should be applied to prisoners, GIs, gays, foreign-born workers, and youth. Repeal all repressive legislation. End all cruel and unusual punishments, including the death penalty. As the economic crisis deepens and big business tightens the squeeze on labor, the elementary civil liberties of working people as a whole are eroded. Government harassment and intimidation challenge our right to assembly and free speech. Government interference infringes on the right of unions to collective bargaining and to strike. Repeal the TaftHartley Act and all other antilabor legislation. Government agencies harass and repress unions and Black, Chicano, Puerto Rican, and American Indian organizations. Socialists and other dissenters are subjected to witch-hunt measures. Not only is it necessary to fight back and reassert our rights, but we need to broaden these rights to protect working people on the economic level and against the threat of new wars, racism, and antilabor drives. We need a new bill of rights to meet the present-day needs of the majority. 8) Right to decide economic and political policy. An emergency public works program should be launched to provide jobs through building homes expanding mass transportation, and constructing hospitals, parks, schools, and other social necessities. Priority should be given to projects where they are most needed—especially in Black, Puerto Rican, and Chicano communities. As a first step, the huge sums necessary to pay for this program should come from eliminating military expenditures, raising taxes on big industry, and placing a 100 percent tax on all income over $25000. Taxes for working people should be lowered. Working hours should be reduced with no reduction in pay in order to spread the available work and achieve full employment. When the bosses close down plants, they should be reopened by the government under workers control. In order to assure economic independence for women, governmentfinanced child-care centers should be established. Maternity leaves with full pay should be granted. Women have a right to decide whether or not to give birth to children. This includes the right to abortion and contraception on demand and protection from forced sterilization. Workers who are not U.S. citizens, including those without documents, have the right to jobs and equal pay without fear of harassment and deportation. A guaranteed living wage is a basic right. As a protection against inflation, wages must be free to rise. No government wage controls. To offset price go ii gi rig in food, rent, gas, electricity, and other basic necessities, wages must be protected with cost-of-living escalator provisions in union contracts so that wages increase with each rise in living costs. Escalator provisions should be pegged to the real rate of inflation as determined by committees set up by unions and consumer groups, not to the Labor Department’s Consumer Price Index, which deliberately underestimates real price increases. All pensions, Social Security benefits, unemployment and disability compensation, welfare, and veterans benefits should be raised to union wage scales and protected with cost-of-living escalator provisions. Small farmers, who are gouged by banks on the one hand and squeezed by the food trusts on the other, should be allowed to make a decent living. They have a right to low interest, long-term government loans. Education, health, and security should not be privileges of the rich. These are rights that should be guaranteed to everyone. Tuition, books, and living expenses should be furnished to all who want to attend public universities and trade schools. Everyone, from birth to old age, should be guaranteed governmentfinanced medical and dental care through a full program of socialized medicine. All retired and disabled persons should receive government-financed benefits at full union wages. The health, welfare, education, and cultural enrichment of all citizens is the responsibility of society. Government-financed programs should be instituted not only to provide care for people who are ill, but for medical research and mass education about health care. Adult educational and cultural programs should be vastly strengthened to permit working people to develop themselves to the fullest extent possible. Television and other entertainment media should be taken out of the hands of private owners and corporate advertisers whose commercials are wasteful and often harmful, and whose programs lack variety and are for the most part culturally barren. Democratic and Republican administrations claim that their foreignpolicy decisions advance peace and democracy throughout the world. The Pentagon papers and revelations about CIA intervention in Chile show that this is not true. We have a right to know the full truth. Publish all secret treaties and agreements this country has made with other countries. No secret diplomacy behind the backs of the American people! Let the American people know the truth about U.S. support for dictatorships all over the world from South Africa to South Vietnam. When corporations claim they can’t grant wage increases, make them open their books. Make the oil, sugar, and grain trusts open their books so we can see their profits, production statistics, and secret dealings. Then we can see who is rigging prices, deliberately cutting back production to create shortages, and hoarding reserves. Expose the threads that tie industry and agribusiness to the big banks; to trnsportation and retailing enterprises; and to government agencies, Democratic and Republican politicians, and judges. Make the gas, electric, and telephone monopolies show us the profits they make when they raise their rates and use polluting fuel. Examination of the financial books of the big trusts should be done by price committees made up of delegates from workplaces, unions, cooperatives, and farmers’, housewives’, and Black organizations. The Watergate affair has revealed a tiny bit of the secret spying, bugging, and harassment carried out by the government. It showed how government policies are designed to work against the interests of working people. We have a right to know the full truth. Let us see what the rulers really have in mind when they make the decisions that affect our lives. Open all police and FBI files! Publish all the White House tapes. Blacks, Chicanos, Puerto Ricans, and other oppressed peoples have a right to control the schools, hospitals, parks, and other institutions in their communities. They have a right to determine how federal and state funds will be used in their communities. To end police brutality remove the police from the ghettos and barrios. A security force democratically selected and supervised by the people in these communities should be established. Take the war-making power away from the White House and Congress. Let the people vote in a referendum before the country is taken into any war. Let us have the right to say no to policies that can lead to nuclear holocaust and the end of humanity. We have a right to say no to government stockpiling and testing of nuclear weapons; to U. S. military bases throughout the world; and to support of puppet generals and military dictators. The small handful of extremely rich families who own the factories, mines, oil wells, utilities, and banks manage them with only one goal—profits. The welfare and security of the majority is no concern of theirs. Workers have the right to control their working conditions through their own democratically elected committees. They have the right to regulate the pace of work in the safest and least dehumanizing way. They have the right to have their own inspectors on the job. They have a right to decide layoffs and whether or not plants will be shut down. Workers have a right to determine that production will be for social needs rather than private profits. To help achieve this all major industries from oil to food should be taken over by the government. AT&T and other utility monopolies should be converted into government owned utilities. All the banks should be expropriated and merged into a single government bank. The concentration of the entire credit system in the hands of the government will provide the latter with the necessary resources for national economic planning. A national economic plan, democratically determined by the workers, will put an end to the present anarchy and breakdowns in the economy. If the majority had known the truth about the oil industry and had the right to make the decisions about the country’s energy needs, the energy crisis would have been prevented. The oil trusts deliberately cut back their refining capacity in order to create a shortage and drive prices and profits up. A national plan worked out and overseen by the workers themselves would not have allowed this to happen. Similarly, a national economic plan under the workers’ management would end the food crisis, establish a mass-transit system, and institute effective environmental controls. The colossal sums now spent for military purposes would be used for social needs. However, this will only be possible if the government itself passes completely into the hands of the majority—the masses of the working people. Today we are ruled by a new tyranny. Industrial and financial barons govern by the rule of profits, denying us the basic democratic and social rights we need for “life, liberty, and the pursuit of happiness.” This government of the few must be abolished and replaced by a workers government that will represent the majority. A workers government will guarantee democratic rights and implement the proposed Bill of Rights for working people. It will immediately recognize the right of Blacks and Chicano to selfdetermination. It will immediately grant independence to Puerto Rico. It will adopt a policy of peace and friendship with peoples throughout the world and offer massive economic and technical assistance and food to other countries—with no strings attached. It will stop U.S. interference in the internal affairs of other countries. It will dismantle all U.S. military bases abroad. Instead of supporting oppressors and dictators it will aid the struggles of the oppressed—Palestinians driven from their homeland by Israel; South African Blacks against their white rulers; Vietnamese against U.S.backed banker-landlords; and Chileans against bloody repression. A workers government in the United States would be a tremendous inspiration to people all over the world. With the knowledge that the mighty USA was a friend, and not their enemy, oppressed people everywhere would rise up against their oppressors. The entire world would be changed for the better. The Soviet working people would throw out their hated dictators and reinstitute the democratic and humanitarian goals of the Russian revolution. The hand of friendship would be extended between the Soviet and American peoples, and the threat of worldwide nuclear war would be eliminated. How can these goals be achieved? The majority can win its democratic and social rights only by its own action. Strikes for higher wages and cost-of-living escalator provisions, with rallies demanding jobs now, demonstrations against cutbacks in education and social services, boycott of scab lettuce, grapes, and wine; and marches against racist attacks on busing and school desegregation are examples of struggles now being waged. But it doesn’t make sense to strike, rally, demonstrate, boycott, or march on one day, and then vote for the parties of big business on the next day. The colonists fighting British rule and the abolitionists fighting against slavery learned that they could have no faith in the goodwill of colonial governors or slave owner parties. They formed their own organizations including committees of correspondence, continental congresses, Black conventions, and political parties. Likewise today, working people cannot rely on the Democratic and Republican parties, which were established to defend the profits of big business. They cannot depend on these parties but must break from them. The Socialist Workers Party believes that the only way to effectively organize the power of American working people on the scale necessary to abolish the present government and initiate a workers government is through a mass socialist party. This will not be anything like the Democratic and Republican parties; it will be a fighting party that will help lead the struggles of working people and all the oppressed. This is what the Socialist Workers Party is campaigning for. As a first step toward a workingclass break from the parties of big business, we support the formation of a labor party based on the unions. A mass Black party and a mass Chicano party would also point the way ahead for all working people. The Socialist Workers Party is campaigning for a new society—a socialist society—where wars, racism, sexual oppression, and all other forms of human degradation and exploitation no longer exist. We believe that this is a realistic goal, and a necessary one if humanity is to survive. Join us in this struggle. 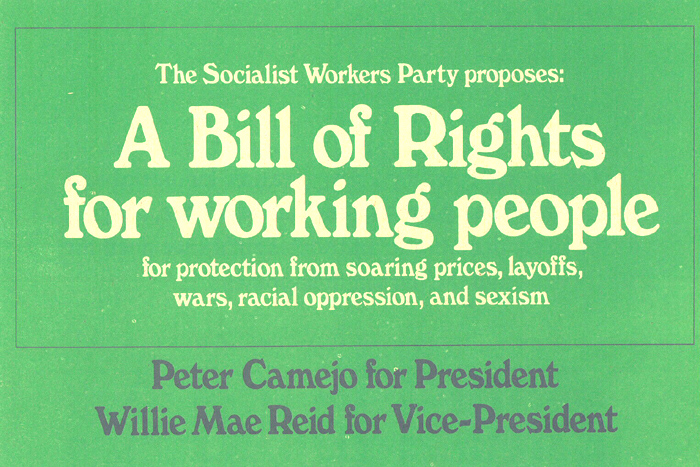 Socialist Workers presidential candidate Peter Camejo has spent much of his life on the front line of struggles to advance the rights and wellbeing of working people. Unlike the Democrats and Republicans running for president, Camejo is an activist in struggles against racist oppression and was a leader of the massive movement against the Vietnam war. Camejo, 35, has been a member of the Socialist Workers Party since 1959. Active in the student movement of the early 1960s, he joined in the civil rights struggles against segregation, and was a leading defender of the Cuban revolution. Camejo became the national secretary of the Young Socialist Alliance in 1962. Denounced by California Governor Ronald Reagan as “. . involved in every large-scale demonstration,” Camejo became known as the central leader of the student movement at Berkeley in the mid-1960s and as one of its most outstanding speakers. Peter Camejo has been active in the struggle against racist attacks on school busing in Boston, and participated in the Dec. 14 Freedom March on Boston against school segregation. Camejo, fluent in Spanish, is the first U.S. citizen of Latin American descent to be a candidate for president of the United States. Willie Mae Reid has worked all her life. She has firsthand experience with the problems facing Blacks and other working people in this country. Reid, 35, is currently a resident of Chicago, Ill. She has worked there as a garment worker, an office worker, and a computer programmer. Before coming to Chicago, she worked in her hometown of Memphis, Tenn., as a kitchen worker in a hospital, a hotel worker, and a garment worker. As a child she spent three months a year picking cotton in the rural South. Willie Mae Reid spent her entire youth in the officially segregated “Jim Crow” South. In 1958 she joined in the civil rights struggles that ended the segregated seating for Blacks on Memphis city buses. After moving to Chicago and working for several years, Reid became a student at Loop Junior College and joined the Afro-American society there. During this time she was influenced by the ideas of Malcolm X, whose speeches she heard on radio and TV. Since that time, Willie Mae Reid has been active in struggles to better conditions in Chicago’s Black community. A supporter of women’s liberation, she helped to organize the Chicago Women’s Abortion Action Coalition, a group favoring women’s right to abortion. Reid became an active socialist in 1971. She was recently Socialist Workers candidate for U.S. Congress. In the fall of 1974 she challenged the entire Daley machine by announcing her candidacy for mayor of Chicago as a candidate of the Socialist Workers Party.